At Custom Golf Carts of Columbia we specialize in building the SC golf cart that is right for your life style. People use golf carts in various ways, whether it be hunting, gardening, neighborhood transportation, business use, or pleasure. We build them from mild, to WILD. You can select your own color, wheels and tires, seats and all the accessories that you can think of. We also build each SC golf cart to fit your budget. When you build your own cart, you select the accessories which results at the price you want, and no add on fees and parts will ever be used so no higher prices for the customer. 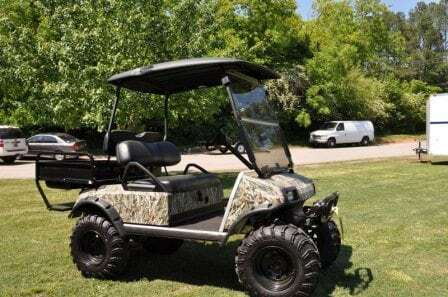 Our most commonly asked builds are Club Car Precedents, including a flip down rear seat, windshield, light package and painted whatever custom color you desire, whether it is pink, green, blue, black, white, orange, yellow, or any color. You can also add lift kits from 3 inches to 6 inches to allow clearance for 23 inch tires, whether you need them for the mud or cruising the streets in style. No matter what your golf cart is being used for, the neighborhood, farm, hunt club, etc, we’ve got you covered!! SC golf cart – Where are we located? Custom Golf Carts Columbia is located at 519 Chapin Road, conveniently close to I-20, I-26 and I-77. Our SC golf cart superstore has everything you need to repair, build and service your golf cart. We are open Monday – Friday 8:30-5:30 and Saturday from 9-2. SC golf cart – Why buy local? When one thinks of golf carts, they likely think of the sport. Yes, SC golf carts are typically deployed on the green, but that doesn’t mean you can only find them there. They are, in fact, often considered to be more of a utility vehicle and can be used in a number of different places.